Similar findings were already described by us in orbital cavernous hemangiomas in 1995.3 Progressive and total homogeneous filling up of an orbital mass on gadolinium-enhanced MR imaging was considered by us as a pathognomonic sign of cavernous hemangioma. All the lesions showed the same high intensity on T2-weighted spin-echo images and showed initial patchy enhancement with delayed and progressive filling in. Since then, we have diagnosed several orbital masses as cavernous hemangiomas. In a recent case in a patient with breast carcinoma (Fig 1), the typical features of an orbital cavernous hemangioma were present, with T2 hyperintensity and delayed filling in of contrast. Because the referring clinician did not believe us, pathologic proof of an orbital cavernous hemangioma was obtained after surgical removal of the lesion. 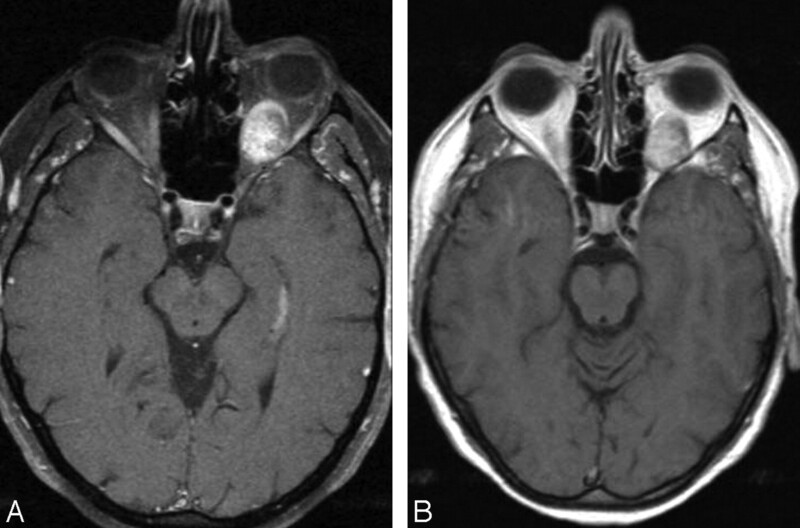 Our experience suggests that cavernous hemangiomas in the cavernous sinus, orbit, and liver have a similar appearance on imaging studies, including strong T2 hyperintensity and progressive filling in on sequential MR imaging on contrast-enhanced studies, possibly corresponding to similar histologic types. Orbital cavernous hemangioma. A, Transverse contrast-enhanced T1-weighted image with fat-saturation immediately after contrast injection. Note patchy central enhancement of the lesion. B, Transverse delayed contrast-enhanced image. Note homogeneous enhancement of the lesion.